The little userinit runner I discussed twice previously has lead to small but constant number of requests for an APK over time, so I finally got myself to release Run Userinit on F-Droid. As a side-effect the current git should build out of the box with a more current gradle version. For some reason the support for init.d and thereby userinit.d has been removed from CyanogenMod starting with CM12. Unfortunately it is not easy to re-activate the functionality, even more so if you want the change to survive future CM updates. Find more details on the repository contents here. Which is nice – and rather pointless as the clients connect with 1G links so they see only one third of that performance at best… Note that the caches will cost extra kernel memory, so if you’re low on RAM you might want to opt for lower cache sizes instead. Update: I forgot to mention that I also switched from the deadline (which is the default for current Ubuntu systems when installed as servers) to the cfq I/O scheduler as the test results from this article suggest that it is the optimal scheduler for RAID Level 5 no matter whether it is HW or SW controlled. I had just finished tuning my ownCloud sync setup, when – after years of smooth, unharmed operation despite numerous cement-terminated falls – the better parts of my N9’s gorilla glass finally decide to break apart as the phone left the the bike mount mid-ride. It seems the mount broke due to modifications I made as it kept pressing buttons unintentionally. 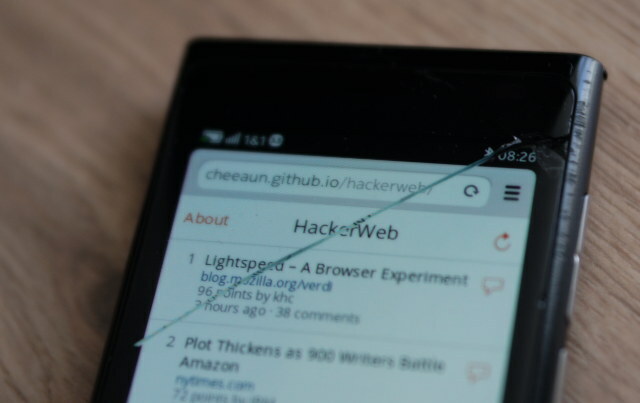 Hopefully I will be able to get my hands on a another (retired) N9 next week so I can use that phone’s display to replace the broken one, which is nice as I wouldn’t know which new phone I would by right now, for some reason the Ubuntu Edge I ordered never shipped. This way I can continue using SyncEvolution with my little script to sync with ownCloud which uses some MeeGo D-Bus magic to pop-up a short message informing me when the sync is complete. As I failed at ash arithmetic the script feels a little clumsy, but it seems to do what it should. Today I finally managed to release a new version of terminatorX, which had been broken for quite a while as some changes in either gtk+ or X.org broke the mouse grabbing code. Anyway, just recently I bought a new mouse as the left button of its predecessor was worn out. I decided to go for a high precision device, so I ended up with a Razer laser mouse (Lachesis). At first I was stunned that the manufacturer actually labels the device as a “weapon of mass destruction”, but hey I use with a piece of software called “terminatorX” – so who am I to judge. Once you get used to the high resolution, the mouse really is a very precise input device – and it does help operating terminatorX quite a bit. The guys from Phoronix gave the mouse (or an earlier version of it) a test and liked it, too, however they were disappointed that Razer does not provide official Linux support. While this still holds true today, I have to say that my experience with the device under Linux has been excellent so far: you plug it in, it works perfectly an you can switch the resolution with the two buttons on top. Some might be disappointed that there is no fancy user interface allowing you to tune and configure the device – I appreciate the fact that I don’t have to configure anything. Trying to perform such an upgrade on a headless system without console will fail. fdisk silently fails to parse integer values larger than 2147483647. The md superblock is located at the end of the partition/disk that you add to the RAID. If the kernel associates the complete drive to a specific md device instead of the last partition, blocking the use of other partitions for other md devices, resize the last partition to leave some (wasted) space at the end to ensure that the end of the last RAID partition differs from the end of the drive. Some manufactures build ‘green’ disks that constantly unload/load their heads, causing the drive to run out of spec in a very short time. If the manufacturer provides a DOS tool to correct that behavior, a pretty easy solution is to put it onto a bootable CD. This stride calculation script helps to optimize the performance of the filesystem running on a RAID5. Cheap desktop drives might be a bad choice for a RAID, if they break during the first re-sync of the RAID you can try to recover your data by re-creating the RAID – Thanks, Adrian! Last weekend I upgraded most of my home systems to run Lucid Lynx. From the software point of view everything went pretty smoothly and I am really happy so far. I like the new look which is not surprising as I’ve been using the Dust theme prior to 10.04 and they are not very far apart. The new Ubuntu One integration is an interesting way of trying to make Ubuntu sustainable, I do hope however that it will stay out of my way if I don’t want to use it. I was close to downloading an album through Ubuntu One until they requested me to register my computer. This is something I do not want to do just to buy an album, so I stopped right there and resorted to the wonderful clamz. Anyway, during the setup I had to realize that CD-Rs have become the floppies of 2010 – not only capacity-wise but also regarding the reliability. I’ve been having this problem with Ubuntu as well as Fedora setups: When you burn the CD-R just before running the setup on another machine with a different optical drive you will often get read errors at some point in time – typically after being halfway through the setup process. This brings me to my request to the authors of Linux distribution setup procedures: If you cannot read a package from the CD please try downloading it from the Internet after asking the user whether it is OK to do so. I fixed one of the setups with a manual chroot onto the new root fs after modifying the sources.list, on another machine I simply used the mini iso which downloads eveything via the network. Yesterday, I finally found the time to flash my N900 with the latest Maemo version PR1.1. I ran the flasher software on a Fedora host and the process performed quickly without problems. After recovering my backup everything was back to normal. Unfortunately I had no wifi available at the time, so when the backup recovery re-established the software setup, it downloaded ~50MB via UMTS which was somewhat unexpected.